In the 400m, I've run a 57.28. In the 800m, I've run a 2:18.27. And I've gone 5'2" in the High Jump. I ran in the 800m at the State Meet my freshman year, where I placed 11th. I ran in the 800m my sophomore year and placed 3rd. And my junior year I ran the 400m (3rd), the 800m (12th), and high jump (13th). I first got involved in track by participating in our school's community-ed track and field starting in 4th grade. From that point on I loved track and joined the school's team once I was in 7th grade. I have played volleyball grades from 4th-12th grade. Being at my Sections meet when I was a 9th grader. It was at this meet that I qualified for the State Meet for the first time. It was also exciting because I broke our school record for the 800. 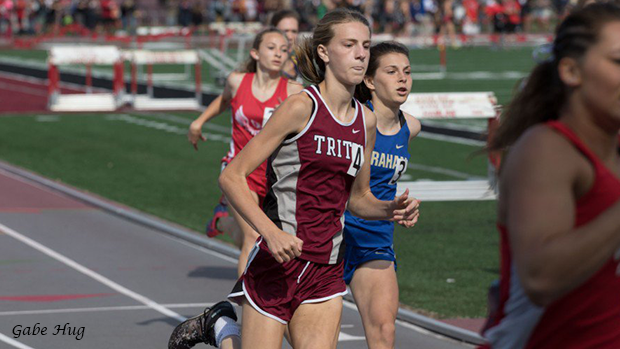 Tell me a standout memory that is track related, but not competition-related (IE, something from a practice, hanging with teammates, hanging with coaches, etc). I really enjoy how many friends I have made over the years because of track. It's fun to be able to go to meets and visit with athletes from other schools. Taylor Kreitinger from Byron. I like competing against her because we both challenge and encourage each other every time we race. Over the years of competing against each other, we have become very good friends. 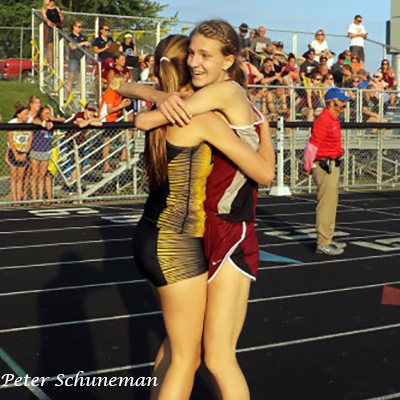 During the past 3 State Meets we have even warmed up together before our 800 races. My dad has been extremely supportive of me. He has always been there to encourage me. He takes helping me very seriously. He gives me workouts to do on the weekends and watches YouTube videos to help learn tips and techniques that will help me get better. 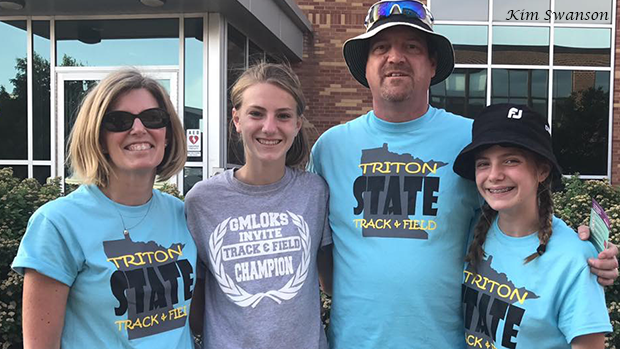 I also have appreciated my track and field coaches at Triton High School. They have always been supportive and helped me reach the goals I have set for myself. Who might we find cheering for you at competitions ? My mom and dad, and my sister, Claire. My friends Kendra Petersohn, Brenna Essig and Jenna Jensen. I also really appreciate Patty and Denny Midthun cheering for me. They are both high school track and field officials in our Section and at the State Meet. What is a challenge, you have had to face as an athlete? During my sophomore year, I had an overuse injury in my foot which caused me to sit out 5 weeks of my track season. 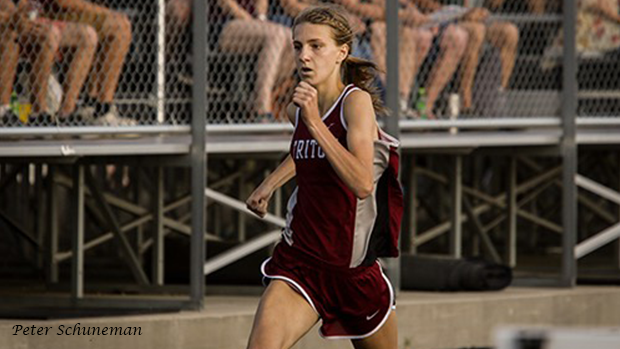 It was challenging, and I was very frustrated that I wasn't able to compete in all of the regular season meets, but by resting my foot, doing physical therapy and staying focused on my goals I was able to return just in time to compete in the State Track Meet. I would like to qualify for the State Meet for the fourth year in a row, and would like to drop my 400 time by at least another second. What was your recruitment process like, and how did you ultimately decide on NDSU? I visited a couple of other schools and ultimately chose NDSU because of their great coaching staff and their commitment to success. During my official visit, it very much felt like the right school and team for me. I always drink grape juice and have a banana before every meet. I enjoy hanging out with friends and watching Netflix/YouTube. I also love to travel and am looking forward to a 15-day long school-sponsored trip this summer to Europe. Set goals for yourself and don't give up on them. Remember that it's not just about the running, track is a great way to get know lots of kids from other schools. I am in my school's musical for the first time and I have a short solo in it. I have no prior singing experience at all.